The reputation of Soun Ogunlola grew tremendously and his authority over his contemporaries was recognized after his return from Oyo. His sons, Lakale, Kekere Esuo, Eiye and Jogioro assumed nobility and started to mark themselves out from the rest of the populace. However, it was Jogioro, a famous, strong and brave man who sought and brought respectability to the leadership of the Soun family, and it was not a surprise that through one of his sons, KUMOYEDE, the Soun dynasty had become firmly established in Ogbomosoland. Before the five sons of KUMOYEDE ruled as Baale in succession, Ologolo, one of the sons of Jogioro and Olukan, the grandson of Lakale (eldest son of Soun) had ruled but briefly. Their rule was terminated by the Alaafin and they died in Oyo and Ikoyi (Ologolo in Oyo and Olukan in Ikoyi). Toyeje, the eldest son of KUMOYEDE ascended the throne and he was followed by his four half brothers, Oluwusi, Baiyewuwon, Bolanta and Odunaro in succession. 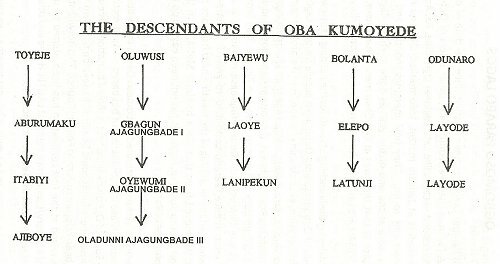 The descendants of these five sons of Kumoyede constitute the present recognized ruling Houses in Ogbomoso. Some events which had earlier threatened to disturb the orderly rotation were resolved either by the force of arms or process of law. In 1869, Otunla who succeeded his father, Ojo Aburumaku, deserted the palace at the approach of Ogbomoso soldiers who were fighting in the Ijesha War (as ally of Ibadan). Gbagun, the rightful prince became the ruler as AJAGUNGBADE I. Balogun Akintola, the son of Balogun Ibikunle accompanied Gbagun to Ogbomoso (Balogun Ibikunle of Ibadan hailed from Ogbomoso). In 1914, Oba Layode who occupied the throne in 1908 was framed, deposed and exiled to Shaki. Oba Itabiyi (1914 - 1916) who succeeded him was assumed to have taken up the turn of his (Aburumaku) ruling House, thus preserving the right of Odunaro ruling House. Oba Oyewumi Ajagungbade II, the father of the present Soun, ruled between 1916 and 1940 from Oluwusi ruling House. Oyekola, (the eldest son of Oba Laoye) whose election as Baale by members of Laoye family and approved by the British authorities died two days before his installation. Some members of Laoye family with the full support of Ilu Chiefs and British Officials approved the appointment of Amao Oyetunde, his son, as the Baale in 1940 against the wishes of other members of Laoye Family and the Ogbomoso progressive elements . In 1944, the appointment of Amao Oyetunde, (a grandson of Oba Laoye) who succeeded Oba Oyewumi in 1940 was set aside by the Judicial Committee of the Privy Council, London and Oke Lanipekun, his uncle occupied the throne. .Oba Oke Lanipekun reigned between 1944 and 1952. In 1952, Ogbomoso District Council took important steps (approved by Western Region Government) to stabilize the Soun dynasty. The title of the Baale of Ogbomoso was changed to Soun of Ogbomoso and the five ruling Houses were given official recognition. There is no doubt that the chieftaincy reform of 1952 aided the smooth ascension to the throne of Oba Olatunji Elepo II who ruled between 1952 and 1966. In 1969, the reign of Oba Olajide Olayode II (who succeeded Oba Olatunji Elepo in 1966) was brutally brought to an end through the Agbekoya peasant uprising. It was not until 1972 that Ajiboye Itabiyi became Soun (from the next ruling House). He ruled between 1972 and 1973. The present Soun, Oba Jimoh Oladunni Oyewumi, Ajagungbade III, JP, CON has been on the throne since 1973. May he live and reign long. The existing Soun dynasty as represented by the descendants of KUMOYEDE (SON OF Jogioro and grandson of Soun Ogunlola) has been firmly established in Ogbomosoland for about three centuries. The title of Baale of Ogbomoso was changed to that of 'Soun of Ogbomoso' in 1952 and Soun of Ogbomosoland in 1992 (Gazette No. 6 1badan January 1993 Vol.13.